The winter sports resort Kühtai. The pass road starts in the bottom left corner, running through Kühtai. The winter sports resort Kühtai is situated in the saddle. A small village, it is part of the municipality Silz. Population numbers and economic activity in Kühtai are highly seasonal. As of 2001, the number of permanent year-round residents was only 29, but due to the many tourists and seasonal workers, the population is much higher over the winter months. 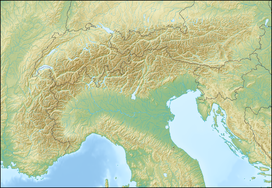 The name "Kühtai" is derived from the Chutay (literally: cow alp), an alpine pasture farm first attested in 1288. A road leading up to Kühtai was first completed in 1628, whereupon the alp farm was converted to a hunting castle/lodge. Holidaymakers first arrived in the eighteen-thirties, and towards the end of the nineteenth century, the hunting castle was converted to a hotel. After the end of the Second World War, Kühtai was developed into a winter sports resort. This page was last edited on 6 September 2018, at 20:54 (UTC).